Volunteer with Time & Talents! Volunteers are crucial to all the work done at Time & Talents, and have always made an amazing contribution to the organisation. We were set up by volunteers in 1887 – and their legacy continues to be at the heart of what we do. Come and get involved – we can’t wait to work with you! Listed below are some of the ways of sharing your skills with T&T! Want to know more? Please email volunteering@timeandtalents.org.uk or call 0207 232 5669 for more information. Every year we hold a Volunteers’ Celebration to thank our volunteers for all their support, and provide regular training sessions to help them build their skills. You can also sign up to our newsletter to find out about new opportunities. Our groundbreaking CWA project takes frail and isolated older people out on Trishaw cycle rides in local green spaces – piloted by keen cyclist volunteers. Find out more about CWA! Can you spare a couple of hours a week to change a life? We’re looking for volunteers who are willing to give one to two hours a week to visit an isolated older person in their home. It’s a great way to feel like you’re really making a difference. Find out more about being a befriender now! Help Us Run Great Events! We need people who willing to offer their time to help with various fundraising events that are held throughout the year. Got an idea? We’d love to work with you to make it happen. We also have golden bond places for the London Marathon! 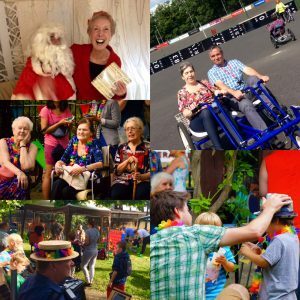 Want to help us run our big community parties? Great! Get in touch! We specialise in helping people with ideas about how to help their community. For example, the amazing Chloe came to us with an idea to set up a lecture group for mums on maternity leave. Within two weeks, with Chloe’s hard work and our help, Changing Mat Talks was up and running. Want to teach someone to bake cakes? Do it here! Want to set up a knitting circle? Do it here! Want to set up a drama group, or help run a kids’ play session? Get in touch! If you want to chat about an idea, or the skills you can offer, drop us an email. T&T always needs help from people with specialist professional skills. If you want to offer your time and expertise to help a local charity, please drop us an email or complete the online application form and we’ll get back to you ASAP.